Italian restaurant Tinello has a prestigious backer in the name of Giorgio Locatelli, the one Michelin starred chef of Locanda Locatelli fame. Locatelli part owns Tinello, and it was with his blessing that brothers Federico and Max Sali, the previous head chef and sommelier of Locanda Locatelli, moved on to set up Tinello. Tinello opened last September on Pimlico Road, on the site where L’Incontro use to be. For a restaurant located in one of London’s priciest residential areas, the restaurant is surprisingly low-key. The décor on the ground floor is clean cut and draws on the use of dark wood, red brick work and low copper lighting. The basement dining room is basic and lacks for atmosphere, so if at all possible, book for the ground floor. Another aspect of Tinello’s low-key approach is its prices. The menu consists of a selection of antipastas, pastas, secondi piatti and desserts. But what appealed the most was the reasonably priced ‘small eats’ which ranged in price from £2 to £4.50. Given how cheap they were, we decided to try four plates between the two of us rather than have a starter each. ‘Burrata’ cheese and tomato bread (£3.20) was a combination of cheesy goodness and bread doused with a warming, rich tomato flavour. This was a lovely dish. 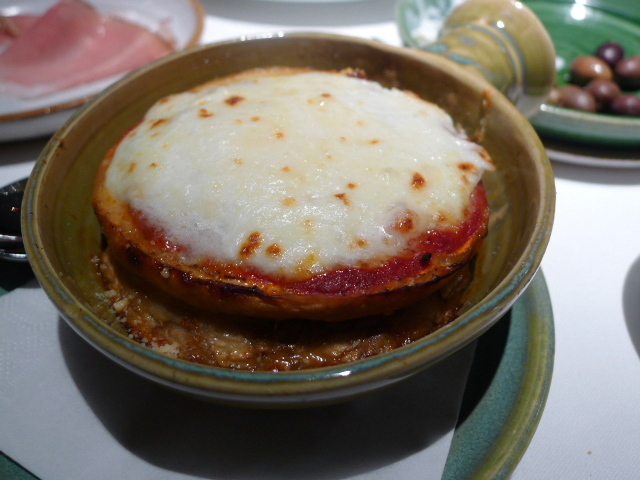 Aubergines and parmesan bake (£4.75) was soft and cheesy. The flavour was respectable, but it could have done with a touch more tomato and a little more seasoning. 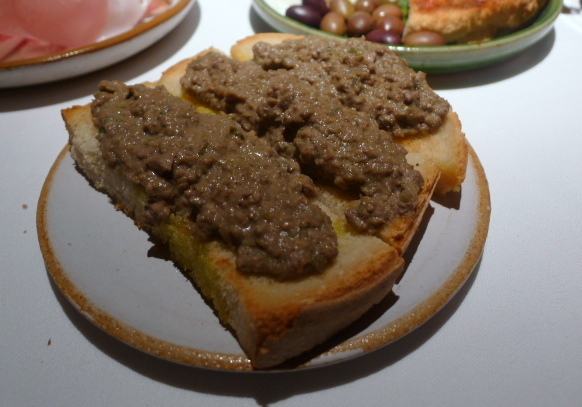 Traditional Tuscan chicken liver crostini (£1.95) had a rich irony flavour and was incredibly rustic and satisfying. Less successful was the cured pork belly (£4.50). 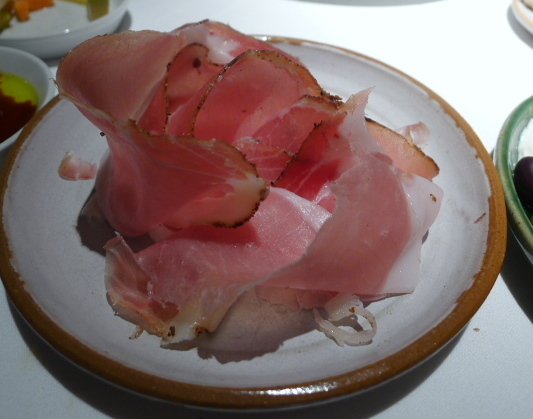 A plate of cured belly slices, this proved to extremely salty – too salty to be enjoyable. Pappardelle duck ragout (£9.50) was a combination of saucy ragout, tender duck and al dente cooked pasta. But it lacked the richness and depth of flavour of the ragout at Enoteca Turi which I consider to be one of the best ragouts that I have had in London. 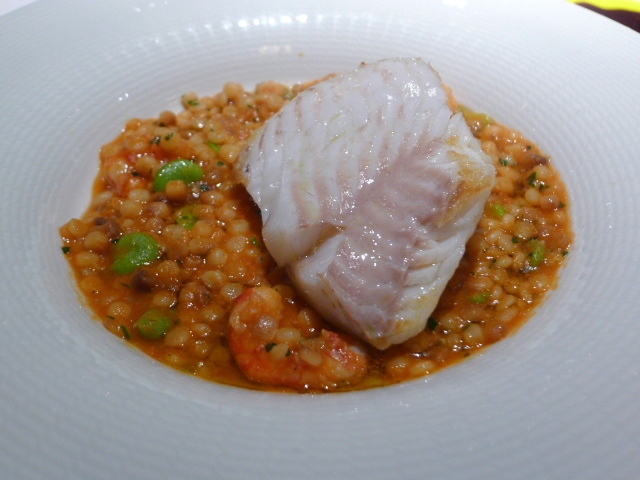 Roasted fillet of Cornish turbot, broad beans, Sicilian prawns and fregola (£22.50) was a passable dish. The fish was well cooked and moist even if a touch under seasoned. But the limp prawns were mushy and unappetising. The fregola was pleasant, but it didn’t beat the wondrous seafood fregola at L’Anima which chef Francesco Mazzei also served at St Alban restaurant on Lower Regent Street when he was still cooking there, and where I first tried this dish. This Tinello version was not one that justified a £22.50 price tag. 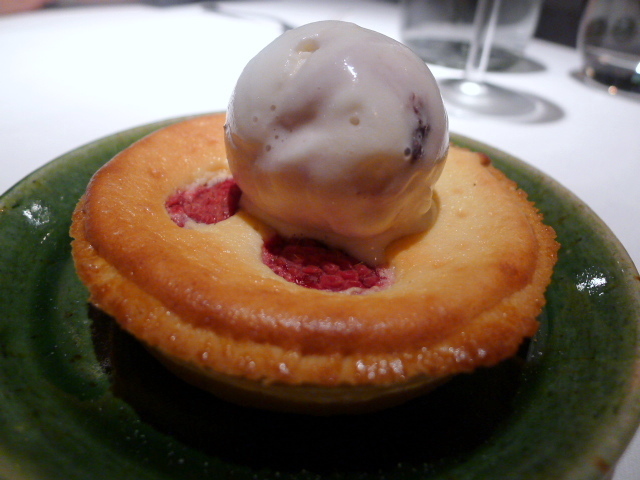 Dessert was a ricotta and raspberry tart with ‘amarena’ ice cream (£6.50). The ricotta provided a lovely contrast to the fruity goodness. The pastry was excellent and wonderfully crunchy. The service was attentive, polished and friendly. On the whole, the food was enjoyable, but it didn’t quite hit the high notes. Admittedly some dishes were more successful than others, but there appeared to be some carelessness in the prep. Whatever possessed Tinello to serve up mushy prawns I will never know. The food doesn’t quite have the finesse that one would expect from a chef who was previously a head chef at Locanda Locatelli. But the service is good, and the prices were decent (other than for the turbot dish). I’d say this is an ‘ok-to-try-but-don’t-need-to-rush-there’ kind of place. 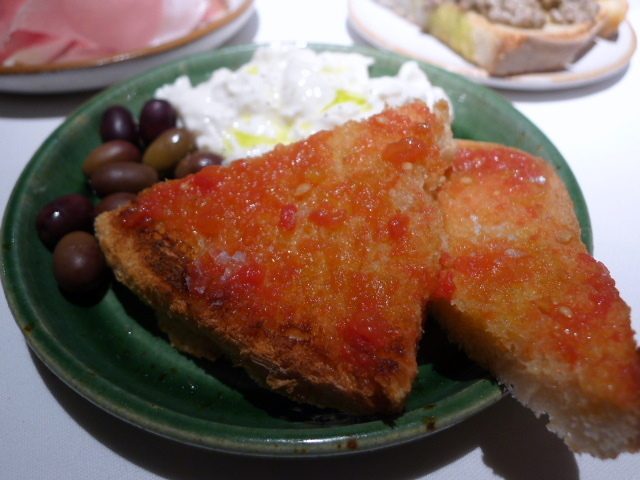 I reviewed Zucca recently and I’d definitely recommend it over Tinello. Price range: £22 – £38 for three courses. Excludes drinks and service. Seems I have got my commenting mojo back so not sure what was going on there! I had quite a disappointing experience at Tinello with badly cooked pasta but since then many friends and other people have really enjoyed their meals so I am not sure whether it was a one off dud. Like you though, I would not be rushing back. Hmm sounds like they are consistently average then. I rather liked Tinello though I found the small plates more acomplished than the mains, sounds like you felt the same.